We've been making buttery, MCT oil-blended "Bulletproof® Coffee" for many months now, using high quality coffee beans and unsalted Kerrygold grassfed butter. I love the way this healthy saturated fat-full frothy beverage makes me feel every morning (until about 2 every day, actually, after drinking it around 7), and I credit it to my 35+ pounds of weight loss since December 2012. 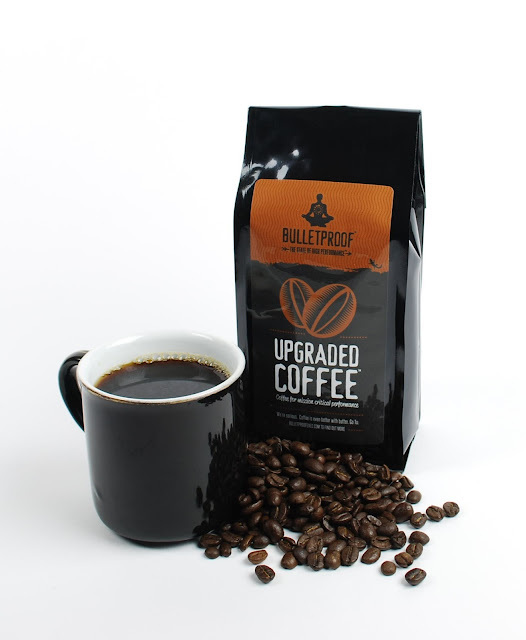 I've learned a lot about the diet that works for me through Dave Asprey's Bulletproof® Diet, but I've also learned about coffee quality through seeing all the research he's done in creating his coffee. Short story is, apparently most coffees grow a mold called mycotoxins and develop chemicals called biogenic amines (histamines)--both of these can make you feel jittery and cause inflammation. To reduce the chances of getting coffee with these issues, you can drink coffee from Central America grown at very high elevations (ideal growing conditions) and from a single origin (reduces the chance of contamination from other fields). But still, often beans are picked when they're not ripe and so go bad before they ripen, often they're old, often they're mixed together so you can't even detect where the problem is coming from. The USDA has acknowledged the presences of mycotoxins but says they can't begin to test for them in all Starbucks around the world, of course, and they don't have any regulatory influence. But, Dave Asprey did a bunch of research and found a source in Central America where he can control where and when and how the beans are picked and roasted. He created Upgraded™ Coffee, which he also tests for mycotoxins and amines. Apparently this incredible toxin-free coffee makes you feel much better than the coffees we're used to drinking. So of course I wanted to try it! It's a little more expensive than the local roasts we've been buying (ex: Happy Cup single-origin roasts), so I never ordered any. But then, I got a bag for my birthday earlier this month and was so excited to finally try it! So, was it any better than other coffees? We've been drinking the Upgraded™ Coffee for the past week, and I did notice some difference. It's roasted by a top quality roaster and the beans are clearly of a high quality, so the taste is of a really good, smooth, medium roast that comes out well with a drip, but is especially good with our French press. As far as the reported effects, the first day I drank it I felt a normal caffeine buzz after a few minutes, but as the morning continued I noticed a consistent, stable energy that carried me all the way until lunch. I also had noticeably less of an energy crash in the afternoon, which was a welcome and amazing feeling! However, if you don't feel like you can afford the expense I would say you would be doing a really good job by finding a local roaster who roasts single origins in small batches, and buy in bulk from them. Single origin coffees are expensive on their own, but with the added cost of shipping the Upgraded™ Coffee it definitely costs more. (There is a 5-pound option that's a better deal, but still possibly more than a quality low-toxin option near you.) If you go the local roaster route and do the research, you'll be getting yourself most of the way there at less cost, and your chances of having mycotoxins in the beans will be limited. I can imagine a future where all coffee is tested for mycotoxins, and regulated to high degree, but at this point there's not enough understanding of these toxins or enough consumer awareness for the large roasters to make any changes to their system. Hopefully, one day, it'll be easy to walk into any corner coffee shop and guarantee that you are buying a clean cup of coffee that isn't slowly poisoning you, but for the time being we've got our local, single origin roasters to do part of the job, and Upgraded™ Coffee for a special treat! I have been wanting to try the bulletproof coffee as well. Will you only drink this now or go back to your local beans? OMG, so crazy the difference between this stuff and the organic Portland Roasting Co stuff at work--which made me so jittery. I wonder if we could mix super high quality coffee, like Upgraded beans or Happy Cup, with something that's pretty good, like that TJ's single origin Costa Rican? Make the spendier stuff last longer... or is that silly? Huh, maybe that explains why sometimes I react to coffee badly (headaches, super jittery) but sometimes not: I don't drink coffee all the time, and often it just happens to be whatever is closest (local if possible, though some of my coworkers are Starbucks addicts and I have to go along). Now I know to be more aware of single origin. Thanks for the lesson, you always do such a great job of being so informative and well researched, like a professional journalist! i had no idea there were so was much that was involved in making good, quality coffee!! I'm thinking I'll get bulletproof coffee for fun some times, but mainly I'll be sticking with locally roasted beans that come from single-origin, high elevation coffee farms, and are water processed. Local beans don't have the same guarantee against mycotoxins, but for me, right now, it's what's practical and I feel pretty good with the results I'm getting. It doesn't hurt that Portland, OR is a hotbed of coffee roasting! I've got lots of options. Thanks Pechluck! This has been a really big learning experience for me as well, and I'm just glad to have a way to to share it with people! Writing posts about the things I'm learning about has been a really great way of solidifying information in my head as well, so it's been a double benefit! See if you notice a difference drinking different kinds of coffee, and let me know how it goes! Grassfed Geek is a place for me to document and share my ideas and experiences of Paleo-centric eating, optimizing mental performance, biohacking, quantified self, and a low-stress, engaged lifestyle. I like to share everything I do to promote high performance in my body and brain, as well as some of the external interests that give my life richness and just make me happy. I strive to be a broad person, and I hope a glance at the blog will show you a wide variety of things that contribute to a healthy, happy life.